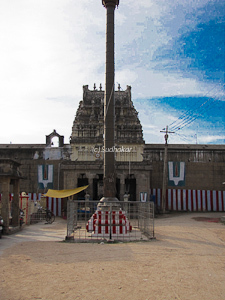 Thiru putkuzhi is one of the 108 divya desam temples situated very near Kanchipuram. As per the legend when Sri Rama relinquished His kingdom and went on 'vanavasam' ( to the forest), Sita spots a golden deer and requests Rama to catch it for her. The deer however is a demon sent by Ravana to lure Rama and Lakshmana away from Sita, so that he could abduct Sita. With Rama and Lakshmana out in search of the deer, Ravana abducts Sita and takes her along with him to Lanka. On the way to Lanka, Jatayu bhagavan (the vulture)and fights with Ravana to release Sita, but Ravana cuts Jatayu's wings and he falls down to the earth seriously wounded. When Rama and Lakshmana come there in search of Sita, they find Jatayu mortally wounded in the forest. Jatayu tells them about Ravana and Sita, and then dies. Sri Rama then performs the last rites for Jatayu. As requested by Jatayu, the Lord here gives his seva in the form in which he performed the final funeral of Jatayu. Jatayu belongs to the Pul (a separate family of eagle) family and was buried in a 'kuzhi' (Tamilword for a deep pit), hence this sthalam is called Thiruputkuzhi. Moolavar is Sri Vijayaraghavaswamy. Moolavar is found in sitting position facing East direction. How to reach? 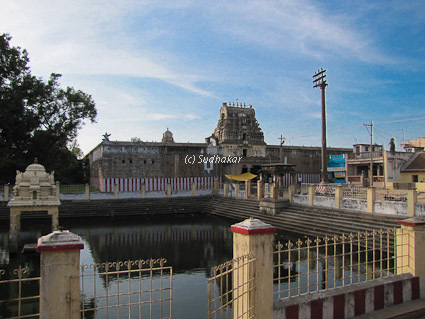 Kanchipuram is around 75 kms from Chennai off the Chennai- Vellore/ Bangalore highway via SriPerumbudur. You can station at Kanchipuram and travel seven miles to this place. Kanchipuram is well connected by several bus services from Chennai. There is a railway station in Kanchipuram with a few train services from Chennai in the mornings.